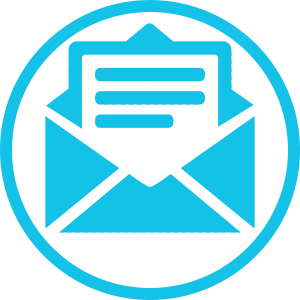 White Shark Ventures are one of the first operators in the industry. 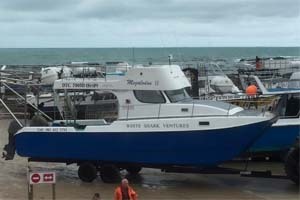 With years of experience and a majority of the staff being with the company since the start of the industry you will not go wrong booking a trip on this boat. 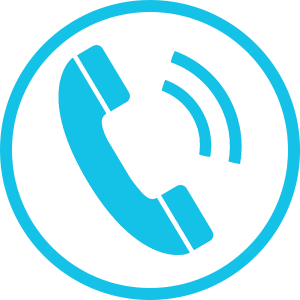 This is one of the busiest companies and most days there is an option of 2 trips. if you don’t like the thought of getting up at 4am for the morning trip then there is a very good chance for most of the year to request to be on an afternoon trip with a later more humane pickup time if you are staying over in Cape Town. 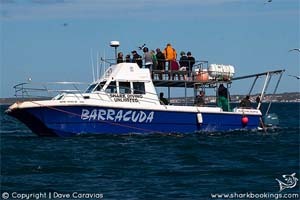 Megalodon II is a 11m x 3.8m cat with 2 x Yamaha outboard motors. 12-volt charging facilities (for cell phones, cameras and laptop computers). Capsize bottle with additional safety equipment. 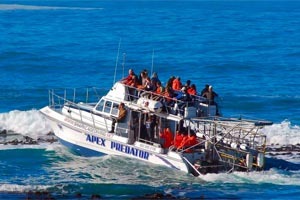 The boat, cage and life-raft are inspected on an annual basis, ensuring maximum safety for all clients. Width: 5.1m this gives maximum stability whilst on anchor at sea. The cage is a galvanized 5-man reinforced steel cage. The cage is well designed with round ends to allow for good clearance and visibility for photography. 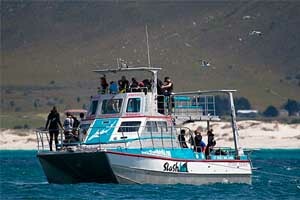 The cage diving is mostly breath holding and occasionally the Hookah system (long hose with air) may be used in the winter months if the visibility and conditions are good and this is pre-booked. 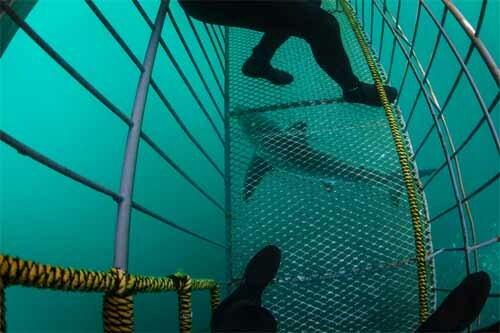 The cage has been carefully designed for the safety of the divers and with no sharp edges around the cage the sharks will not be harmed in any way. 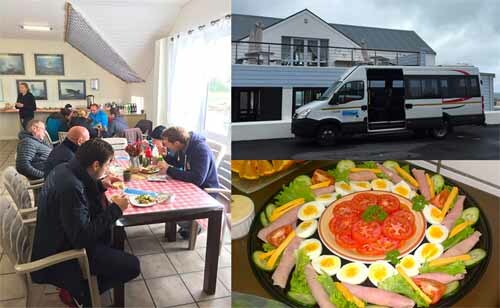 Arrive at the shark diving crew house office early morning for a buffet breakfast whilst listening to the dive briefing for the trip. You will have a chance to browse our shop ‘Shark Alley” which is in the same building and get a fleece, jacket, camera or other goodies before the trip. Following this, you will head down to the boat which is facing the building. 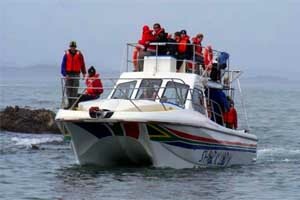 The boat ride to the shark diving spot takes 15-20 minutes. 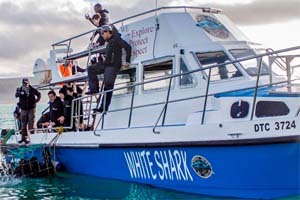 On arrival, the crew will start chumming the water and once the sharks are around the boat the cage will be put into the water and cage diving will commence. Sharks are surface feeders by nature and you will see the Great White Sharks on the surface when coming up to the boat and bait. Surface viewers can watch from the upper deck which offers an excellent viewing perspective and you can decide when on the boat if you want to go in the cage. This is simple to do and anyone can go in the cage as long as you can hold your breath for 10 seconds then you will be fine. Most people when seeing the sharks realise that they are not as scary as they thought and then decide to cage dive. 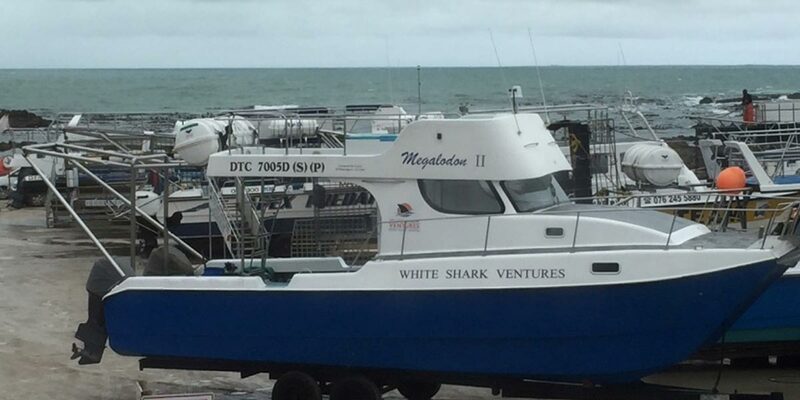 If you only want to see the sharks from the boat then you will have plenty of time to watch the sharks circling the boat and passing the cage. 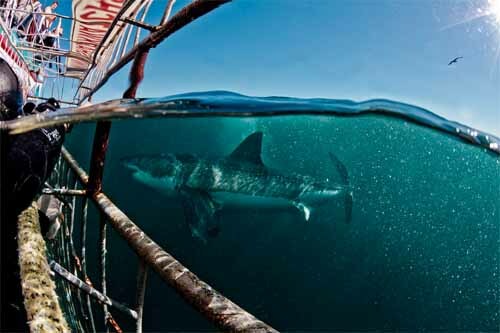 In the summer when the visibility is low the sharks tend to be more aggressive on the bait and this is spectacular to watch especially when they launch out of the water next to the boat. 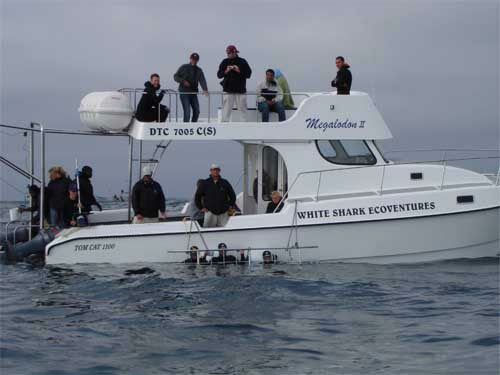 White Shark Ventures was established in 1992 and was one of the first companies to offer shark viewing / diving tours at Shark Alley. The directors consist of Cindy Thornhill, Mariette Hopley & Francis Saul. 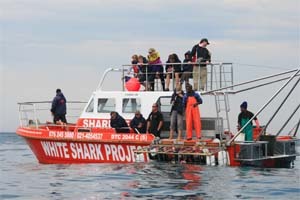 They are the founders of the Great White Shark Protection Foundation which is a body consisting of the white shark operators in Cape Town and Gansbaai. The crew are registered tour guides with dive master qualification and advanced medical first aid qualifications.